Responsive and Mobile Plus. Empower your customers by enabling Mobile Plus, and adding your business information. 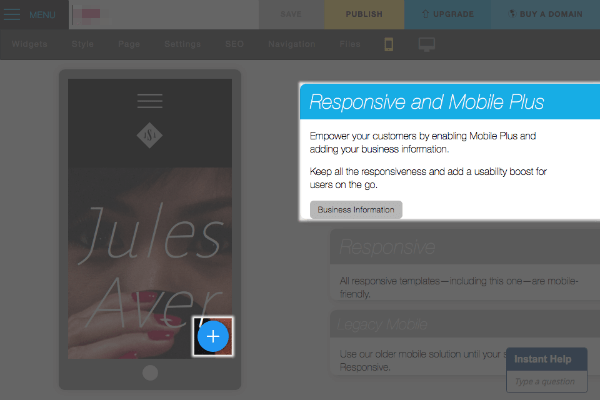 Keep all the responsiveness and add a usability boost for users on the go. Responsive. 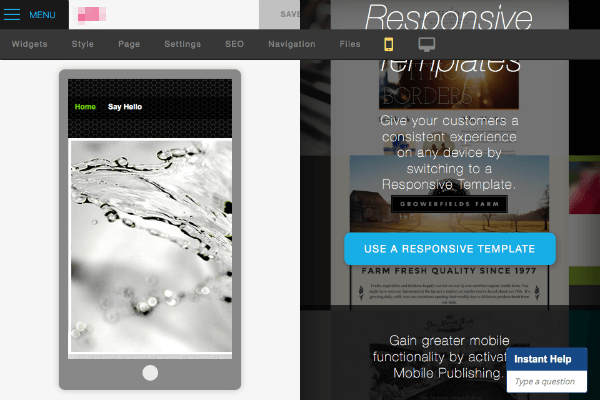 All responsive templates are by default mobile friendly. Legacy Mobile. 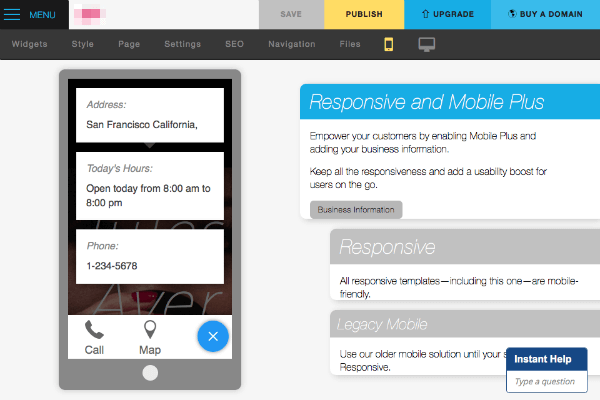 Use our older mobile solution until your site is ready for responsive. To access Mobile Publishing, click on the Mobile preview button located along the top of the screen. The Mobile Plus option is available for any of our Responsive templates. and is exclusively available to users of Website Builder Unlimited or higher. This adds a usability boost for users on the go, by displaying your business phone number, operating hours as well as the physical address. You can see this by clicking the + directly in the mobile preview screen. If you don’t wish to have your business information displayed, you can switch from the Responsive and Mobile Plus option to the Responsive option. If you are not already using a Responsive Template, then you can switch to one, by selecting the Use a responsive template option displayed. 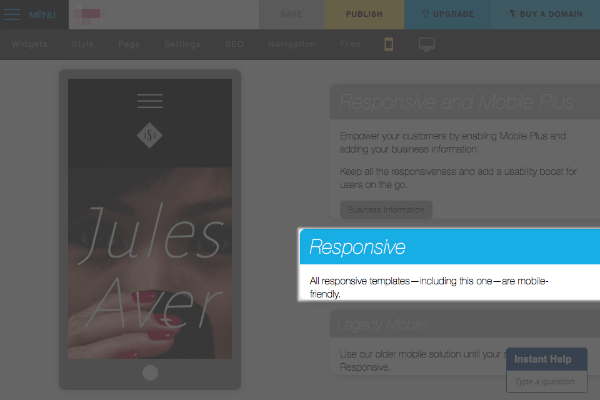 All responsive templates are by default mobile friendly. You can change your header’s background color and font, to differentiate it from your non-mobile-optimized site. You can choose whether to display your site’s banner image on your mobile-optimized site. 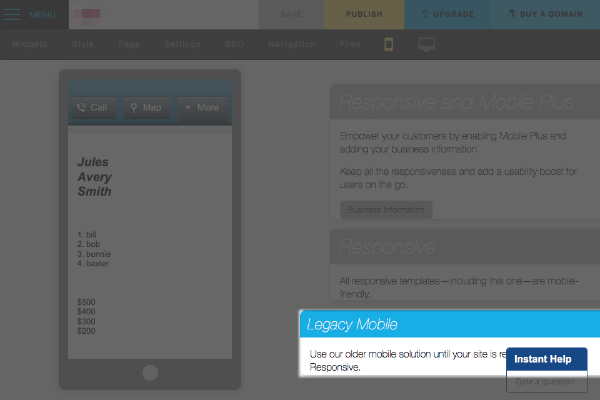 Please note: If you are using a non-Responsive style and do not use the Legacy mobile publishing option, your site will not pass Google’s Mobile-Friendly test.